Laptop design has always been about compromise. Though they’ve come a long way in the past few years, laptops have never been able to offer the features available in desktop computers, and certainly not at comparable prices. In order to squeeze an entire computer into a portable shell (and have it be power-efficient enough to run on a battery for hours at a time), computer makers have to throw features overboard. And the smaller and lighter the laptop, the more compromise there needs to be. The MacBook Air, Apple’s latest Intel-based laptop, is the lightest, thinnest laptop Apple has ever constructed, and according to Apple, it’s the thinnest laptop ever made. And in many ways, the story of this laptop is the story of a series of compromises, all made in order to fit an entire Mac in a three-pound package that’s three-quarters of an inch thick at its thickest point. The MacBook Air’s keyboard, backlighting excepted, is the same square-keycapped design featured on the MacBook. And its 13.3-inch, 1,280-by-800-pixel display is identical in size to the one found on the MacBook. However, the Air’s screen is notably different because of what’s lighting it from behind: a light-emitting diode (LED). The LED backlighting is extremely bright, but what’s more impressive is that it immediately turns on at its full brightness. The MacBook, in contrast, starts out somewhat dim and gradually increases in brightness. Despite its diminutive size, the MacBook Air doesn’t feel fragile. I wouldn’t recommend trying to break it over your knee; the keyboard feels solid, as does the Air’s entire bottom half. I noticed a bit of flexion on the top of the laptop—the portion behind its screen—but even there the MacBook Air felt sturdy. There’s no way to tell how this laptop will fare in high-stress situations, but it certainly feels durable. With the keyboard and display set, then, there are only two other ways for the MacBook Air to distinguish itself from its cousins: thickness and weight. Let’s start with weight, as this is one measurement where the MacBook Air truly excels. Prior to the Air’s release, Apple’s lightest laptop was the MacBook, which weighs five pounds—a full two pounds heavier than the three-pound Air. In fact, Apple has never released a laptop lighter than four pounds: the PowerBook 2400, PowerBook Duo series, and even that 12-inch PowerBook G4 all weighed somewhere between four and five pounds. If your laptop lives most of its life on a desk, weight isn’t an issue. If you carry it with you at all times, weight can be its most important characteristic. Most people’s laptop use falls in between, and depending on the vagaries of your commute, the number of miles in your frequent-flyer account, and the strength and health of your arm and back, weight may or may not matter to you. One reason I loved the 12-inch PowerBook G4 was that it crossed some hard-to-define weight barrier, one I hadn’t even been aware of until I started using a laptop that crossed it. The 12-inch PowerBook was so small and light that carrying my laptop around with me became an afterthought. Instead of lugging a 15-inch PowerBook from place to place, I could idly hold the 12-inch model in one hand. The MacBook Air takes that easy feeling to an extreme. Though it’s not quite as solid in my hand as the 12-inch PowerBook (owing to the latter’s additional width), it feels as thin and light as a loaded manila folder or a couple of magazines. That brings us to the MacBook Air’s thinness. This product seems to have been designed specifically to be as thin as possible, with an eye toward making the marketing claim that the MacBook is “the world’s thinnest notebook.” And there’s no disputing this. Even my six-year-old daughter—not exactly the world’s foremost expert on laptops—couldn’t resist telling me how “really flat” she thought it was. Yes, I’ll grant you, I can almost slide the MacBook Air under my office door. But I don’t believe the extra thinness is going to gain me much working room when I’m wedged in a coach airline seat behind someone whose seat is fully reclined. Or on my daily bus commute, when I'm sitting in a seat so small it makes coach look like business class. In these situations, reduced depth would be more likely to improve the angle of my screen and keep the front of my laptop from pressing against my chest. But in that dimension, the MacBook Air is no different from the MacBook. In order to make the MacBook Air small and light, Apple had to remove features once considered standard on all Apple laptop models. This model is the first in recent memory to have no built-in CD/DVD drive and no FireWire ports. Its internal storage is limited, and its connection to peripherals has been reduced, too. In order to take advantage of the Air’s light weight and small size, users must be willing to sacrifice some of the features that they previously took for granted. Let’s start with the optical drive. Yes, you can buy an 8x SuperDrive for $99 as an add-on. (It will add seven-tenths of a pound to your bag and doesn’t exactly look elegant when it’s hanging off the side of your tiny MacBook Air.) 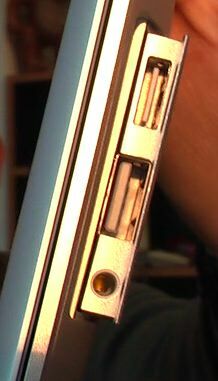 As someone who uses the optical drive in his laptop so rarely that I sometimes forget whether its slot is on the front or the side, I don’t really consider the lack of an optical drive a major omission. If you’re someone who lives or dies by the ability to burn or play back CDs or DVDs, however, you’ll find this to be a major drawback. Apple has, to its credit, exerted quite a bit of muscle in an attempt to make the Air’s lack of an optical drive a nonissue. In addition to selling the external SuperDrive, the company has added a feature called Remote Disc that allows the Air to take over the optical drive of another computer (Mac or PC) on your local network. Just install the Remote Disc software (included on the Air’s install disc), and the MacBook Air can use Bonjour to browse your network and read what’s on any data disc. This feature worked well in my testing. The MacBook boot software has even been updated for the Air so that it can boot via Remote Disc in the event that you need to reinstall Mac OS X. Although Remote Disc is a nice addition, it has limitations. It’s meant for installing programs and copying files, and doesn’t work as a remote DVD player or CD ripper. Apple helpfully suggests that the iTunes Store stands to assist you in all your music, movie, and TV show needs, but of course many users may prefer to consume content that originally began its life on optical discs. Using a tool such as HandBrake ( ) is certainly an option in order to make DVDs watchable on your Mac as well as your iPod or iPhone, but converting a movie can be a time-consuming experience. For all my nonchalance about optical drives, I know that the last time I was really sick in bed at home, I whiled away the hours watching DVDs on my MacBook. With the MacBook Air, that sort of behavior won’t really be an option, short of having an external SuperDrive hanging around at the ready. However, Apple hasn’t compromised when it comes to the MacBook Air’s video-out capabilities. They match the MacBook’s, including the ability to drive an external monitor as large as Apple’s 23-inch Cinema Display (1,920 by 1,200 pixels). It also shares the MacBook’s Intel GMA X3100 graphics processor circuitry, which means neither laptop will ever be a gaming powerhouse. More of a compromise is the pathway by which users can attach peripherals to the MacBook Air: a single USB 2.0 port. First let’s address that port on its own merits: if you want to attach more than a single USB device to the MacBook Air, you’ll need to invest in a USB 2.0 hub. In a desk-bound configuration, this can actually work quite well. I tested the MacBook Air attached to the USB port of the aforementioned 23-inch Apple Cinema Display, and then on to a Belkin-powered four-port USB 2.0 hub. I managed to attach an external hard drive, an iPod, an iPhone, an Apple keyboard, a Kensington trackball, and the MacBook Air’s own USB Ethernet adapter all at once, without any trouble. However, using USB devices on the road could be more problematic. If you usually count on having two open USB ports on your Mac, you’ll need to carefully consider if your working style will still function with only a single port available, or if you’ll need to invest in (and carry around) a portable hub. Keep in mind, too, that the MacBook Air’s USB port is also the place where you must connect its SuperDrive (if you need to read or write from optical discs). And If you don't have a USB hub, you'll also need this port for connecting any other peripheral, including the Ethernet USB adapter. In other words, that one USB port is going to be awfully popular.